Every person in the xMatters system is a "user" defined by a set of details, including ID number, user name, login password, and so on. Each user has a set of permissions that define the features to which they have access. The Users page displays a list of all the users in the system that you have permission to view. You can use the filters, search criteria, and other settings on the users page to refine the list. For example, you can locate a single user, find all the users that belong to a specific site, or see a list of just those users you supervise. You can also export the list of currently displayed users to a spreadsheet; for more information, see Export a list of user details. Users with similar roles and permissions may see different results because the "All Users" option does not display all of the users that exist in your deployment. Instead, it displays all of those users assigned to roles that your role has permission to view, and all of the users you supervise (even if you would not normally be able to see those users based on their roles alone). For example, if two person supervisors supervise a different number of users, and those users include people with roles that would not normally be visible to a person supervisor, then each of the supervisors would see a different number of users when they select the "All Users" option. In the xMatters web user interface, click the Users tab. If this is the first time you've visited this page, xMatters displays a list of the users in the system that you supervise. Click the All Users button to show the list of all users in the system that you have permission to view, or click the Users I Supervise button to display only the users you supervise. If the list contains more users than can be displayed on your screen, scroll down the page to view more users in the list. Note that the system will automatically load more users as you scroll; you do not need to navigate to another page. If you have the correct permissions, you can click the name of a user in the list to view their details . To delete a user, select the check box next to the user or users that you want to remove, and then click Delete Users. Note that the deleted user will also be removed from any groups to which they belong, and all of their devices will be deleted. You can add users through the web user interface. Before adding users to xMatters, you should be aware of any naming conventions or rules regarding user IDs and numbering systems used by your organization. Users must have unique names within xMatters. You cannot create a user with the same name as any other user, group, or dynamic team. If you are using a trial or free version of xMatters, you can add users using the Invite users feature. In the web user interface, click the Users tab. On the users page, click the Add icon in the top right corner of the users list. xMatters displays the Add a User page. Select this option to authenticate with an LDAP server instead of a user name and password. The value of the User ID field must match the user's LDAP identifier. Select a server from the LDAP Server drop-down list. The LDAP Authentication option is displayed only if your administrator has configured LDAP on your deployment. Selecting LDAP authentication will remove the Password, Confirm Password, and Force Password Expiry fields from the Add a User page. The user's name. This value can be used to search for the user in the database, to check their schedule, or to look up the user or their device details. A user's name can later be changed without affecting notifications. A unique identifier that the user will use when logging into xMatters. This is a mandatory alphanumeric field of up to 25 characters. This value can only be changed by a supervisor or an administrator. Maximum 30 characters. The password rules defined for your organization will be displayed when you begin typing in the Password field. For more information about password rules, see Password rules. For more information setting the password policy, see Set the password policy. Re-type the password in this field for confirmation. The user's primary location. The site setting determines company and site holidays, phone class lists, default language, and time zone. If the user is assigned to a site that is not active (or not enabled within xMatters), they will not be able to receive notifications, so verify the site is active before selecting a new site. Click in the field to see a list of available roles for you organization. For more information about roles, see Default roles. Customized fields for your xMatters deployment that can be used to sort, organize and locate users. The settings and information required in these custom fields are determined by your xMatters administrator, and are unique for each company. Click Add to create this user. If you'd like to create another user immediately after you've finished adding the current user, select the Create Another check box before you click Add. If you have permission to supervise other users, you will automatically become the supervisor of any new user's you create. If you do not have permissions to supervise users, the users you create will have no supervisor. Company supervisors can upload multiple users at one time by using the User Upload tool. For more information about using the User Upload tool, see User Upload. If you would like to automatically synchronize your xMatters users with an external system such as an LDAP system or your human resources directory, contact Client Assistance, who can help you configure the EPIC data synchronization process. All users in the xMatters database count towards the license limit. This means that users not set as Active (i.e., on the sidebar of their user profile) are still counted for licensing purposes. For further details on xMatters licensing, contact xMatters Sales. If you are using a trial or free version of xMatters, you can add users through the Invite Users feature in the web user interface. The Invite Users feature helps you get your team members into xMatters quickly while entering a minimal amount of information. You simply enter the names and email addresses of each user, and xMatters sends them a welcome message that provides information about how to get started. When xMatters sends the welcome message to a user, it creates a user with the role you selected on the form. The user ID is set to the user's email address (instructions to create a password are included in the welcome message). Additionally, xMatters creates email and phone devices with the contact information you provide on the form. Once you've added users into xMatters, you can configure additional settings such as their site, language, time zone, and custom attributes. 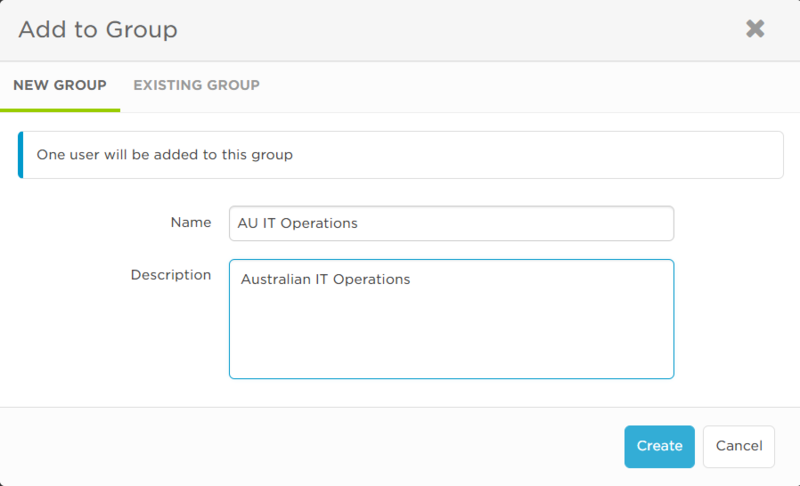 You can also assign supervisors, configure devices, assign roles, and add the users to groups. For more information about configuring users, see Manage users. On the Users tab, click Invite Users, or click your user name in the top-right corner of the page and select Invite Users. Type the First Name, Last Name and a valid Email Address for each user you want to invite. This email address becomes the person's user ID and is also added as an email device. See Valid email address format for more information. Providing a Phone Number for each invitee is optional; if provided, this phone number is added as a voice device. The country code defaults to your country code — make sure to check this and change it if you're inviting users from a different country. Standard User: Can maintain their profile, respond to alerts, self-subscribe to subscriptions, and send messages. Full Access User: All permissions, with the exception of administrative tasks. Company Supervisor: Can maintain and administer a company, with full permissions for company administrative tasks (Admin tab) and developer tasks (Developer tab). Click + Invite Another User to add another user. The Invite Users dialog also displays your user count: how many users you've added and how many total users you can have. Click x to the right of a user to delete them from the list. Once you're done adding users, click Send Invitations. After you've invited these users, you're given the option to add them to a Group. After you click Send Invitations, a pop-up window asks if you would like to add these users to a group. Groups allow you to schedule when users are on duty, the order they are notified, and how long to wait for them to respond. You have the option to add users to a new or existing group. Click Add Users to Group. On the New Group tab, type a Name for the group, and add an optional Description. The users you've just invited are added to a new default shift that is always active (24 hours a day, seven days a week). To get started creating new shifts or otherwise modifying the group, see Schedule shifts. Click the Existing Group tab. Use the Group drop-down to see the list of existing groups, or start typing the name of the group then select if from the list. If the group has existing shifts, you can use the Shift drop-down to select a shift to add the users to. 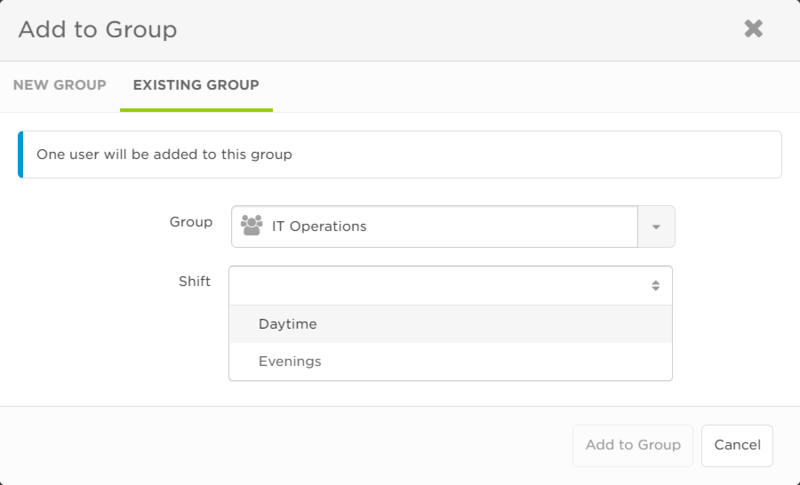 If it doesn't have existing shifts, the group's name appears in the Shifts field as the default (which you can edit). See Manage groups for more information on managing groups, viewing a group's calendar, and configuring a group's roster. On the Users page, click the name of a user to modify their details. You can only click the names of users for which you have the "View Person" permission. Set or edit the user's details as required. You can permanently remove users and their information from the system by deleting them. When you delete a user, they will be removed from any groups which they are a member, and their devices, details, and login information will also be removed. Any scheduled messages they own, and their temporary replacement assignments will also be deleted from xMatters. Use the Search tools described in Search for users and groups to locate the user you want to delete. Select the check box beside the user’s name, and then click Delete. You cannot delete a user if they have active notifications, if they are the only supervisor of a group, or if they own subscriptions. In these cases, to delete them you must first terminate or wait for their active notifications to end, assign another supervisor to any groups where they are the only supervisor, and delete or change the owner of their subscriptions. You may also need to delete the user from an external database, if you synchronize user data from an external system with xMatters. This will prevent the user from being added back into xMatters during a data synchronization process. You can also deactivate users in xMatters to prevent them from being able to log in or receive notifications. This enables you to quickly disable an account without deleting it. Inactive users count against licensing limitations. For more information about product licensing, contact xMatters sales. Find the user that you want to deactivate, and click on their name. On the sidebar of the user's profile, click the toggle to make the user active or inactive. You can use the Export Users feature to generate a comma-delimited list of all users in the system (or a specific sub-set of users) to analyze the data in an external tool, or to import the data into another xMatters deployment. This feature generates a CSV file in the format supported by the User Upload feature. xMatters displays the users list, which defaults to showing all of the users you supervise. Use the available filters, options, and search tools to refine the list to show the users you want to export. The selection check boxes for individual users do not affect the Export feature; they are used only to select users for deletion. To export the currently displayed list of users, click the Export icon . xMatters creates a file named User Export <date/time>.csv, where <date/time> is a timestamp of when the file was created. The following table provides information about the fields included in the user export file. For more information on formatting this file to upload users, see Modify the upload template file. Last Login The last date and time the user logged into the xMatters user interface. For example: 2015-07-30 14:40:20 PDT. Custom field types and values are assigned by administrators to help sort, organize, and locate users. To properly display names with special characters, such as accents and umlauts, in an external spreadsheet program, you may need to manually select UTF-8 encoding as the file origin when importing the CSV file.